My crafty mojo has been sadly lacking recently. What I really needed was a simple, easy project whose benefits could be immediately enjoyed. 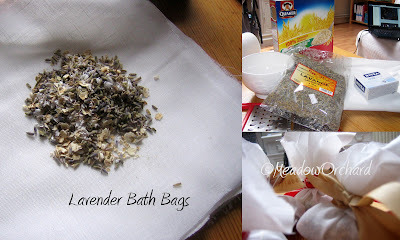 I turned to Cheryl's how-to for Lavender Soap Scrubs over at Time to Craft. As I used mine for a luxurious long soak in the bathtub rather than a shower, I found myself thinking of them as bath bags. If you haven't visited Time to Craft, you absolutely must - there are loads of easy crafty and baking tutorials, and most are designed to be done for or with children. So head on over there right now! These things are super easy to make - you just put a spoonful each of grated soap, dried lavender and rolled oats into a square of muslin, and then tie it up with ribbon. The part that took me the longest was finding the muslin in my extremely cluttered fabric stash! I made five bags in all. The muslin is from an off-cut I bought from the 'puces' at Le Chien Vert. It cost €6, and I used less than a tenth of the fabric, so that makes a cost of around €0.12 per bag. The ribbons came from chocolate boxes and other wrapped gifts. I always hoard this ribbon because I can't bear to throw it away but I never have anything to use it for - well, now I do! Full costing below, but it works out as about fifty cents per bath bag. The most expensive item is the soap, and this would probably be a good craft to use up the odds and ends of soap when bars are too small to really use. After my luxury lavender bath experience, I will use less soap next time, and will add a drop of lavender essential oil to each bag. I think this would also be nice using dried rosebuds instead of lavender. What a lovely idea to use them in the bath. Oatmeal makes a lovely soothing bath. Hope its helped with your crafting mojo. Oatmeal is fantastic, but I'm always a little nervous that it will get washed down the plughole, expand and block it... It's definitely kick-started my crafting, thanks!